About a month ago, I decided to research the various calorie counter applications available for smart phones and computers. I experimented with a couple of different applications, but they all seemed very limited when it came to both the food database and functionality. 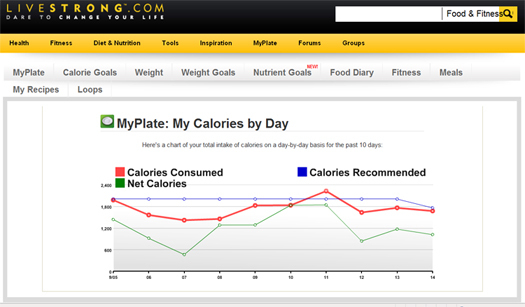 Then I discovered MyPlate on the LIVESTRONG web site. MyPlate is available for free online and you can upgrade to a Gold membership to get some additional functionality. The mobile application, Calorie Tracker, is available for several smart phones for $2.99. I’ve been using both versions for about one month and have been especially pleased with the web site. The web site has a clean design and is easy to use (unlike other sites which were so crammed with information I didn’t know where to start). You begin by entering your personal information (height, weight, etc. ), goals such as weight loss, and activity level. You then log in your food and fitness activities each day. The food and activities databases are excellent! MyPlate boasts the largest food (700,000 foods and beverages) and fitness (1,500 activities) databases online. I would have to agree. It also allows you to enter new products into the database, assemble ingredients into a recipe so you don’t have to log in individual items each time you have a particular dish, and you can manually log in your food and fitness activity in the event you can’t find a match in the database. I have found the chart, below (part of the free web site program), to be very motivational. It really helps with my accountability. When I originally started the program I used a standard 2,000 calories-per-day goal, but just recently changed it to meet my specific goal (maintaining my current weight) so it now reflects a 1,756 calories-per-day requirement. As you can see, the Calories Over Time function allows you to view your recommended daily calories, actual calories consumed and net calories, which is calculated when you input your fitness activities for the day, for the past 10 days. This visual cue has proven very helpful in reminding me of what and how much I am eating and exercising. I have two names for this chart: Doh! or Yes! About four weeks ago I had a Doh! moment when I saw just how many calories I had eaten in one day – 3,500+! It’s amazing how quickly calories can sneak up on you – even when you are eating what you think is a healthy salad. If I was smart, I would have asked for the nutritional information for the wolf in sheep’s clothing salad before I ordered so I could have made a better choice. Such is the gift of hindsight. We are all entitled to occasional “fun” days when we let ourselves indulge a little, or, on this particular day, a lot. Looking at the chart reminds me when I need to get back on track. While losing weight is not one of my goals, I have lost 2 pounds in the last month by simply being aware of what I am eating. The online version is a very robust application and the vast majority of functionality is free – but you do need to put up with advertisements. However, the ads are offset by the large amount of information and health and wellness tools available – too many to list in this blog post – on MyPlate as well as the LIVESTRONG web site in general. There’s even a MyPlateD for diabetics. Set Custom Nutrient Goals: maybe you are watching your sodium or cholesterol, or need to load up on carbs for a big race. View your Daily Nutrition Chart: choose calories, carbohydrates, protein, fat, calcium, vitamin A, sodium, cholesterol, sugars, or dietary fiber. The chart below is a personal example of my dietary fiber intake for today. There is also a feature called Week at a Glance where you can see what you ate for the past seven days in a menu-style format. Honestly, I don’t see the value in this feature. If anyone from LIVESTRONG happens upon this post, please contact me and tell me what I am missing. I can only speak to running the app on a BlackBerry Tour – it is difficult to navigate and easy to make mistakes (I couldn’t figure out how I was up to 1,170 calories from a banana and yogurt. Apparently, I had input 10 servings of yogurt instead of one). It does sync with your desktop, so that’s good. While $2.99 is certainly not a huge expenditure, I recommend saving your money and using your phone’s notepad to jot down what you ate and then enter the information when you get to your laptop/desktop. The experience is likely quite different on different phones so perhaps it’s worthwhile for others. As I mentioned at the beginning of this post – I looked at several other web sites and applications but found nothing as robust and easy to use as MyPlate. Plus, you get so much more, for free, on the LIVESTRONG web site. I can’t imagine using anything else. I hope you will give it a try and that it makes a difference in helping you to achieve your nutrition and fitness goals. LiveStrong.com has been a powerful tool for me. Over the years I have counted calories, but must admit that I never really added them up. 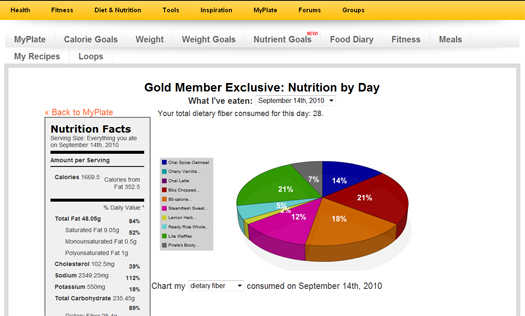 LiveStrong.com has helped me see the real numbers and it holds me accountable to my daily intake. I started using it Aug 12th, about 4 days before I started boot camp and have since been on the site daily. Between LiveStrong.com, boot camp and my choice to be healthier, I have lost over 10 pounds and a total of 10 inches. The database of food is quite large, but there are those times that you have to just take a guess. So having the option to request food that is not in the database is a nice bonus. The exercise database also seems to be accurate for the amount of calories burned during working out. My HRM (heart rate monitor) has been reading 720 to 750 calories burned during my 60 minute workouts. Which matches Calisthenics – vigorous which states 60 minutes equals 653 calories burned. The free version works just fine, but there are a lot of ads. I did sign up for the pay version, but I don’t really see the benefit. Copyright © 2015 KeepWell Foods. All Rights Reserved.